Naomi and Saul canoe away from Gods Lake. It’s becoming very cold, but Naomi makes warm shawls for Saul and herself by cutting up their tent. In the coming days, Naomi and Saul move down the river. They stop and to cook and eat the geese they’ve caught that summer, and as they eat they’re utterly silent. Saul and Naomi are understandably shaken by the death of Benjamin and the disappearance of John and Mary—hence their eating in silence. Naomi is a wise, experienced older woman, and she takes good care of Saul in this time of crisis. She has tricks up her sleeve for staying alive in times of cold and hunger. After four days of travel, Saul and Naomi hit some rough water, and they’re forced to swim away from the boat. They swim through the icy water and make it to land, where they continue their journey on foot. Snow falls, and their progress is slow and agonizing. At night, however, Naomi calms Saul by telling him stories about the Long Ago Time. She tells him that Saul’s great-grandfather carved out a trail through the wilderness, and that they’ll walk along this trail to find their way to safety. Naomi isn’t just resourceful; she’s the guardian of her family’s traditions, stretching back many generations. The passage is a good example of how, in times of danger, tradition and family history can be important sources of guidance and inspiration. Saul and Naomi continue through the wilderness. Naomi claims that they’re close to Saul’s great-grandfather’s trail, though Saul himself can’t see it. She points into the distance, where she can make out railroad tracks. By the time they reach the tracks, they’re both extremely tired and cold, but they have finally arrived just outside of the small town of Minaki, where Naomi’s nephew is living. It is perhaps symbolic that Saul can’t see his great-grandfather’s trail; it may foreshadow Saul’s impending alienation from his own cultural roots. As readers are about to learn, Saul goes on to lead a very different life from the traditional way of life observed by his ancestors. Saul and Naomi rest for a moment by the railway platform in the freezing cold. As Saul rests, he hears voices. Men pull him to his feet and carry him away to a car. Saul can see Naomi, raising her hands as if to hold him for a little longer. But she’s silent, and her face is blank. Naomi seems to be coming to the end of her life. She’s risked her own safety to take good care of her grandson, and yet her grandson is taken away from her. The men who take Saul away don’t seem to pay any attention to Naomi, even though she clearly needs attention—their only concern is pulling Saul away from his family. The scene echoes the earlier scene in which Benjamin is stolen away from his family. With this, Saul is separated from his family, and embarks on a frightening new chapter in his life. Arn, Jackson. "Indian Horse Chapter 10." LitCharts. LitCharts LLC, 6 Sep 2017. Web. 23 Apr 2019. Arn, Jackson. "Indian Horse Chapter 10." LitCharts LLC, September 6, 2017. 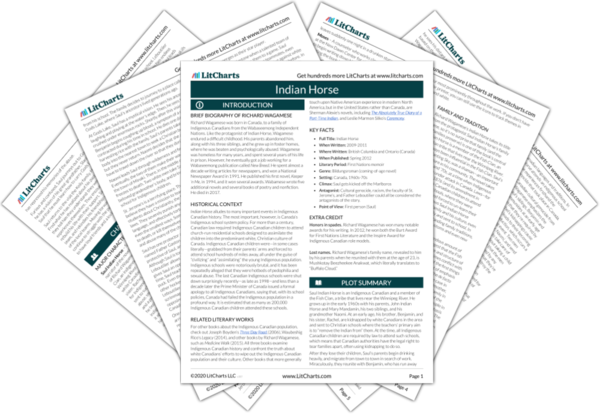 Retrieved April 23, 2019. https://www.litcharts.com/lit/indian-horse/chapter-10.